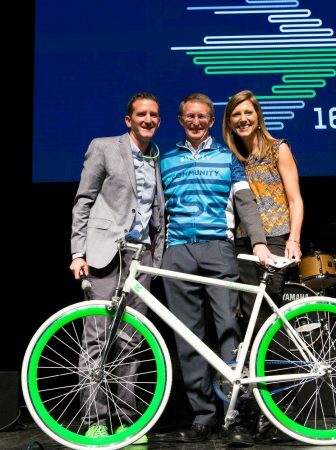 December 19, 2016 - Mike Gardner, President and CEO of third-party logistics provider Kane Is Able, Inc. was awarded the 2016 “Fearless Fundraiser” award by Pelotonia, an organization that runs fundraising bike tours to fight cancer. Pelotonia announced the award at the Pelotonia 2016 Check Celebration on Wednesday, November 9th at Express Live, an indoor-outdoor concert venue in downtown Columbus, OH. Pelotonia directs 100 percent of every dollar raised by participants to cancer research at The Ohio State University Comprehensive Cancer Center, Arthur G. James Cancer Hospital, and Richard J. Solove Research Institute. Founded in 2008, Pelotonia was established with the objective to fund life‐saving cancer research. Pelotonia’s ride weekend is a three‐day experience that includes a weekend of cycling, entertainment and volunteerism. In its first seven rides, Pelotonia has raised more than $100 million for cancer research.